Tsujita LA Artisan Noodle, a temple of ramen on Sawtelle in West L.A. has so many ravenous (or is it ramen-ous?) devotees that one Los Angeles location simply wasn’t adequate. The new branch across the street is called Tsujita ANNEX and officially opens today (after a four-day sneak preview open only to those who brought along a printed Facebook invitation). 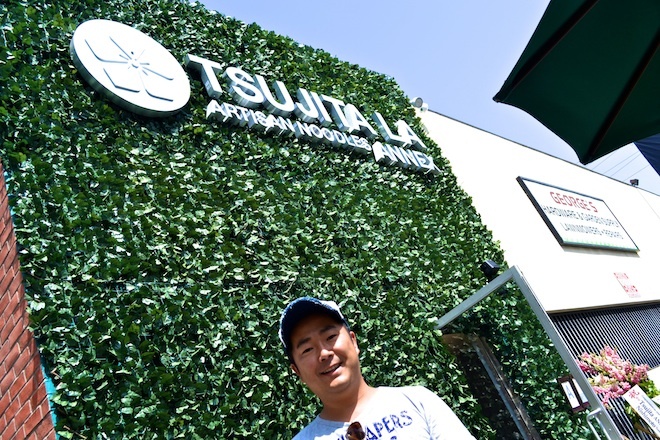 This weekend, I was fortunate enough to speak to Tsujita’s president and owner Takehiro Tsujita via translation by Tsujita Annex’s manager Sachiko. The ramen guru is not often in L.A. given that he bounces around internationally, checking in on his many noodle houses. The Annex serves up tonkotsu shoyu (soy sauce) ramen while the original Sawtelle location does not. The noodles at the new location are thicker, roughly twice as burly as those at the other house. Tsukemen or dipping noodles is the most popular item. Ramen will be served at night (!). Meanwhile, the Tsujita empire is expanding even as we slurp. Along with the two L.A. restaurants, there are seven in Tokyo, and one each in Bangkok, Singapore, and Hong Kong. Though two more coming this year to Jakarta (August) and New York (December), there are no plans for additional locations in L.A.
Mr. Tsujita also mentioned that he doesn’t desire to see long lines in front of the ANNEX. He doesn’t want to overwhelm and overwork his staff. He feels the quality of food and service will suffer if this happens. He doesn’t wish to make a fortune.